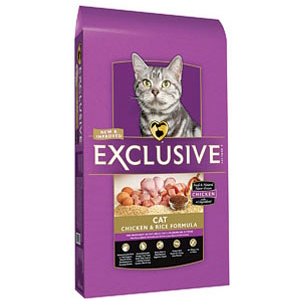 Exclusive Chicken & Rice Formula Cat Food starts with chicken as its #1 ingredient. Chicken is an excellent source of high quality protein for building strong muscles and lean, healthy bodies, is highly digestible for less litterbox waste & odor, and is rich in essential fatty acids for healthy skin & coat. Nature’s best ingredients, starting with chicken, go into Exclusive Chicken & Rice Formula Cat Food, providing purposeful nutrition to help ensure your active cat or growing kitten remains healthy for life. All Exclusive formulas are thoroughly researched and quality assured for balanced nutrition your pets will love. Our blends are inspired by the comforts of home and the sometimes-particular palates of cats: chicken, hearty flavors and other wholesome hard-working ingredients. And we guarantee you’ll never find unnecessary fillers. It’s a promise you can see: lean, active bodies, healthy vitality, shiny coat, highly digestible for less litterbox waste and odor, and pure excitement as they dig into flavorful goodness at every meal. AAFCO Dog Food Nutrient Profile. Exclusive® Chicken & Rice Formula Cat Food is formulated to meet the nutritional levels established by the Association of American of Feed Control Officials (AAFCO) Cat Food Nutrient Profiles for all life stages. The feeding directions are based on an eight-ounce measuring cup. One measuring cup contains approximately 3.3 ounces (94 grams) of Exclusive® Chicken & Rice Formula Cat food. Adjust the amount fed to maintain ideal body condition. Pregnant, nursing cats and kittens may require 2 to 3 times the recommended amount to maintain ideal body condition. Consult your veterinarian regularly to help maintain your cat’s ideal body condition and health. When changing your cat’s diet, do so gradually over a 7 to 10 day period to avoid an upset stomach. Provide fresh, clean water at all times.